Anytime you get J.J. Watt tweeting his acceptance on your NFL debut, you must have done something right. 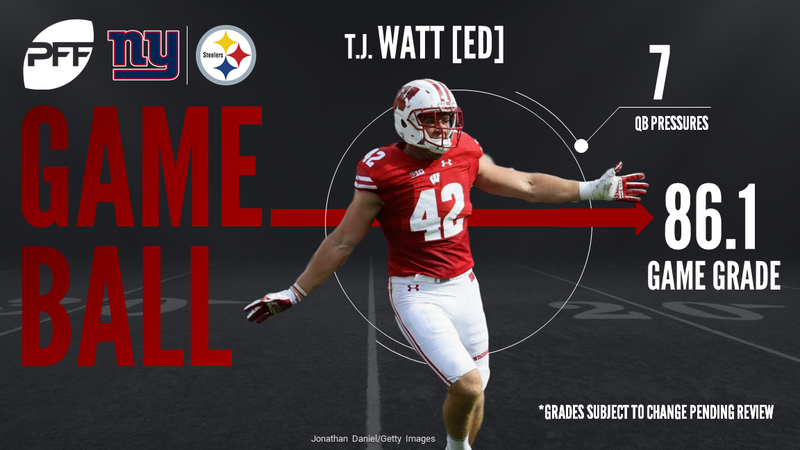 That can surely be said about the performance Pittsburgh Steelers rookie T.J. Watt, younger brother of the three-time defensive player of the year, turned in on Friday night against the New York Giants. Watt impressed while Giants quarterbacks Geno Smith and Davis Webb struggled. Fellow rookie Joshua Dobbs saw his woes for Pittsburgh, yet the Steelers came out victorious, 20-12 and with that, we refocus and give you our PFF exclusive takeaways from the contest for each team. After a nightmarish start that saw him throw a nightmarish pick, Dobbs rebounded with a couple nice throws down the field. He was 2-of-4 on deep passes for 72 yards on the night and a very respectable 95.8 passer rating on passes targeted 20 or more yards downfield. While it was Dobbs throwing the deep passes, it was Hamilton creating the separation that made it easy on his quarterback. He hauled in both of his targets on the day for 72 yards and touchdown, and fielded a perfect 158.3 passer rating when targeted. The stat sheet looks spectacular, and there’s nothing wrong with making the plays that come your way, but Watt’s six total pressures (including two sacks) and batted pass are inflated a bit, as was his 25.0 pass-rush productivivty mark. His first sack was of the clean-up variety as QB Josh Johnson was flushed his way and the second came as an unblocked rusher to an overloaded side of the pass protection. Still, it was an impressive debut for Watt who also had a couple of nice rushes against fellow rookie, OT Adam Bisnowaty, while also picking up a run stop. Moats played 400 snaps for the Steelers a year ago and his vying for a role as a versatile backup once again this season. He got in on three sacks to go with two more hurries and he was in the right place at the right time to pick off an errant pass from QB Geno Smith. Moats also missed two tackles, a rarity for the James Madison product as he’s missed only nine of his 162 career tackle attempts. Looking to rejuvenate his career in a backup role with the Giants, Geno Smith got off to a rough start with a two-interception performance. He forced a pass into coverage for a pick just before the half and his second turnover, while the receiver ran the wrong route, was a disastrous decision to fire a pass into the waiting arms of Steelers LB Arthur Moats. Smith has to make better decisions as he was a tick slow in the pocket, as evidenced by his 3.23 time to throw on the evening. Third-round rookie Davis Webb closed it out for the Giants, and he had his struggles throwing the ball down the field (1-for-6, 19 yards on passes thrown 10-plus yards in the air). He airmailed multiple throws and took an unnecessary sack instead of throwing the ball away, though he did go 6-for-7 on passes up to 10 yards. Webb showed some of the same pocket characteristics that he showed at Cal, leading to some off-balance throws, though he did maneuver outside the pocket to find WR Kevin Norwood who was unable to haul in an accurate pass along the sideline. If he’s going to replace Jonathan Hankins, this was a good start. Rookie Tomlinson had three run stops in 17 snaps versus the run and had a few nice bull rushes on top of that, all-in-all finishing with a solid run-stop percentage of 18.8.